I'm launching into my fifth and final round of preschool. After this year, I'll have no PRE...just school. And that sad reality, like all of life's lasts, makes me pause and reflect. The first time around the preschool block found me ordering all the stuff and checking all the boxes. Like most first-time homeschool moms, I wanted preschool to feel REAL. I wanted it to mirror the "school" that I was used to. I found validation in "formal." But with each preschooler, I slowly tossed all the fluff and started gathering the things that really mattered. You'll find no printable worksheets here because I'm not after a cut-and-paste education. On my fifth time around, my list of great resources has grown. And yet, QUALITY always rules out over QUANTITY. In the end, all my preschooler really needs is a firm grasp of the alphabet and good books. The end. And to be honest, even the whole "alphabet" thing is negotiable. 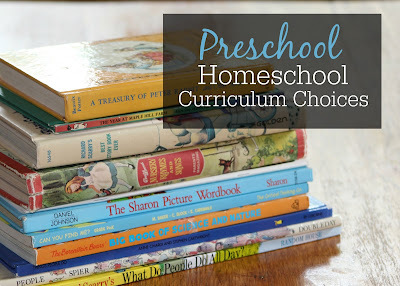 So here's my list of the best preschool "curriculum"...ten years in the making. See With Me Bible- He can't read yet. But, other than a few chapter titles, this Bible has no words. It is strictly pictures and tells complete Bible stories frame-by-frame. While I use the ABeka K-4 book, I only use it for phonics. And even then, I use it very loosely for a skeletal scope-and-sequence. For the most part, I prefer to make my own lesson plans by combining hands-on activities and living literature books. The Sharon Picture Word Book- This is a classic picture "dictionary" that shows pictures/words for each letter of the alphabet. The American Speller (only the first half)- This is an absolutely beautiful vintage book that teaches both the basic alphabet sounds and special digraphs through illustrations and narratives. The Year at Maple Hill Farm- I will read each "month" portion at the start of that particular month. Wild Animal Baby magazine- I was able to find a large collection of outdated preschool animal magazines at a garage sale a few months ago. As part of their child-of-the-day responsibilities, my oldest four kids will rotate throughout the week and read a short section of one of these magazines to their younger brother. He will be learning and they will be practicing their reading skills AND fostering great sibling connections. My son is a snuggler. If he could be super glued to my lap, he would be. With lots of books at our side, we'll be carving out plenty of snuggle time this year. No curriculum needed! This is amazing! Thanks so much for compiling this list! I’ve spent the last few weeks researching preschool options. As kids added on, we couldn’t do all of it, but just compiling those books is a great idea.